3. O. Vyshnevska, N. Bobrovska. Adaptative approach guarantee in the state environmental safety. 13. N. Sirenko, A. Burkovska, T. Lunkinа. 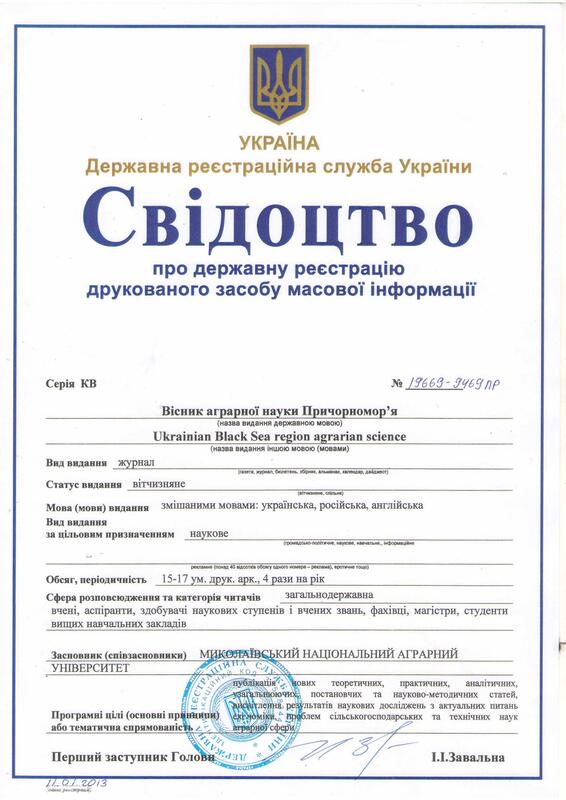 Business social responsibility in Ukraine. 20. V. Krylenko. Regional aspects of the innovation policy of the agricultural sector development. 26. I. Belous.Prospects for the development of viticulture and winemaking in Mykolaiv Region of Ukraine. 38. V. Rybachuk. 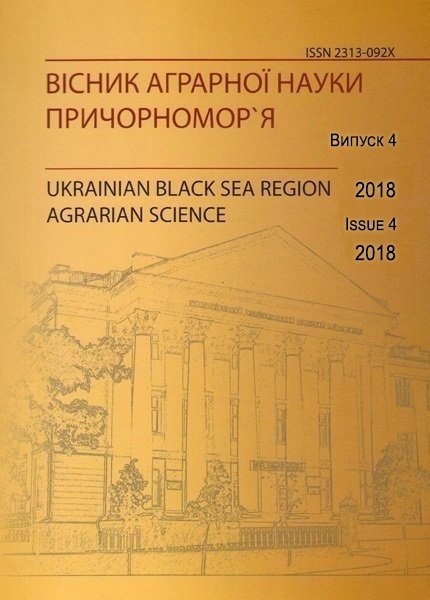 State and regional measurement of agrarian production’s efficiency in Ukraine. 50. V. Gamajunova, V. Shevel. Shaping to productivities and quality varieties millet depending on sowing dates and background of fertilizer in condition of South of Ukraine. 62. L. Antipova. Foliage is an important indicator of quality for alfalfa sorts. 69. V. Dvoretskyi, T. Hlushko. Formation of productivity of spring wheat under the influence of modern growth regulating substances in the South of Ukraine. 79. V. Mykolayko. Photosynthetic potential and intensity of flower formation in seed chicory. 89. Y. Ivasiuk. Productivity of soybean crops under separated and integrated applications of microbiological substance, plant growth regulator and herbicide. 96. M. Boiko. The impact of sowing density and time on the productivity of grain sorghum hybrids under conditions in the South of Ukraine. 104. L. Postolenko. Growth and development of black currant depending on the use of mulching and irrigation. 116. A. Likhochvor. The impact of fertilizers on the yield of false flax (Camelina sativa). 124. L. Patreva. Prospects of international cooperation between Ukraine in the sphere of security and quality of product food. 135. I. Bankovska.Analysis of the quality of carcasses and meat of pigs of different commersial genotypes. 159. А. Stavinskii, O. Plakhtyr, О. Palchykov. Distribution of induction in the working gap of axial induction motor. 180. Y. Kirichek, V. Granik. Information support of lands monitoring and the creation of territorial geoinformation systems of real estate cadastre. 194. A. Haleeva, V. Hruban. The rationale options of tecnology module for many factors action corn collection. 202. N. Dotsenko. The features of the classification of quality management system with regard requirements of international standards. This entry was posted in Сontents. Bookmark the permalink.